Getting back to those umbrellas: here's one. It's flat, black, boring and very umbrella-like. plastic, but I can live with that. Same umbrella, after manipulating the canopy with some pins. Mock-up of the redrafted canopy. Are we looking more Edwardian-ish yet? I've added some new hat pins in my etsy shop, and relisted a bunch. I have a large batch that still needs photographing, including a handful that lean decidedly more steampunk-ish. I have no idea when I'll get around to listing those...hopefully soon. Here are the ones that went online today. The ones that are made from antique buttons look marvelously close to originals. Yellow Pearls and Sparkles, 12"
Autumn in the Vineyard Pair, 10"
Autumn in the Vineyard, Large Medallion, 12"
Here are a couple more that I haven't listed, because I'm keeping them (for now). Why does she have so many umbrellas? I'm almost back! As you can see from the gaps in my posts, I have to take long hiatuses every so often. It's painful to be away from costuming so long, but at least it's temporary. I'm not quite free to come back yet, but I had a delivery yesterday so I thought I'd post a preview of what's coming up. 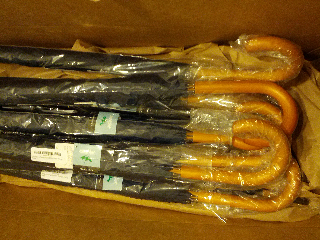 Yup, that's over a dozen umbrellas. More to come soon.